Kaufman Trailers line of Paver Flatbed Trailers is specially engineered to meet the rigorous demands and the specialized loading requirements of hauling paving equipment. Paver Flatbed Trailers are only offered in our Deluxe model package. We start with a high tensile pierced main frame, and add 10,000 lb. dual wheel electric brake axles with radial tires for a long lasting frame and running gear. We incorporate a long dovetail with 9 ft. bi-fold spring assisted ramps. This gives a long, gradual loading angle. The bi-fold ramps have three springs per ramp. The long dovetail combined with the 9 ft. bi-fold ramps gives a total of 15 ft. of length for a gradual loading angle to reach the top deck. This length is necessary because of the low ground clearance involved with a paving machine. 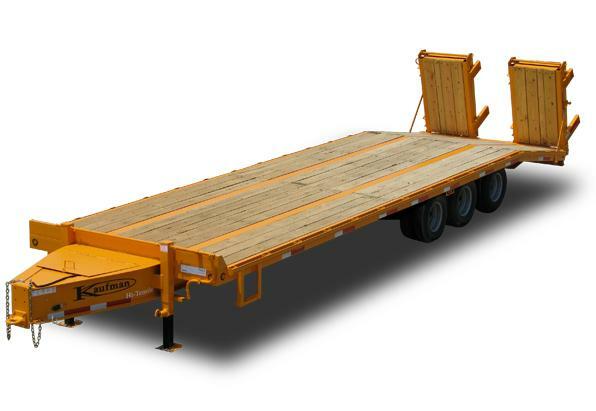 Optional hydraulic loading ramps are also available on all Paver Flatbed Trailers and are highly recommended. These hydraulic ramps feature a fully self contained battery operated hydraulic pump system. This minimizes user effort. Either ramp set-up is easy to use. The Hydraulic Paver ramps with 6′ dovetail option is also available on any Kaufman Trailers AIR BRAKE Heavy Equipment Flatbed Trailer OR DELUXE Drop Deck Flatbed Trailer. Kaufman’s Deluxe Paver Flatbed Trailers combines all our best features with a heavy duty frame. The medium paver model starts at a 25,000 lb. GVWR. This model has a 12″ pierced I-beam frame. The heavy duty paver model increases to a 14″ pierced I-beam frame. GVWR is still 25,000 lb. Two 10,000 lb. dual wheel electric brake axles with radial tires, 16″ pierced crossmember centers, and 6″ channel outer rail with stake pockets and rub rail are standard included features. The 38,500 GVWR model has three 10,000 lb. dual wheel electric brake axles with radial tires, a 14″ I-beam mainframe, 16″ pierced crossmember centers, and 6″ channel outer rail. A pressure treated wood floor, and full reflective tape are included. A sealed modular wiring harness with lifetime LED lights assures trouble-free lighting on all Deluxe Paver Flatbed Trailers. Need Replacement Parts? Visit our Online Parts Store now! 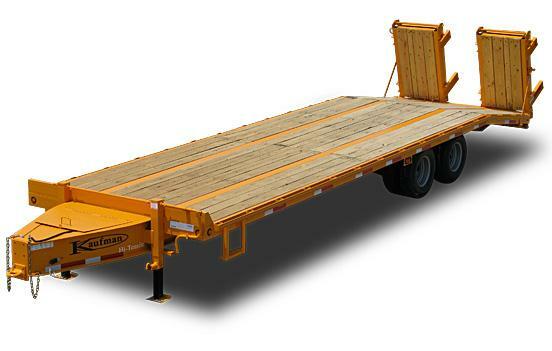 VIEW OUR ENTIRE LINE OF FLATBED TRAILERS! Kaufman Trailers medium duty 25' tandem axle paver flatbed trailer features a 12" I-beam high tensile mainframe with cold-formed tongue, oil-bath tandem dual axles, and 9' bi-fold paver ramps. The 9' ramps combined with the 6' dovetail make loading of paving equipment safe and easy. Kaufman Trailers heavy duty 30' tandem axle paver flatbed trailer upgrades to a 14" I-beam high tensile mainframe with cold-formed tongue for the rigorous demands of hauling paving equipment. 10,000 lb. oil-bath tandem dual axles. The standard 6' dovetail and 9' bi-fold ramps give a total length of 15' for a very easy loading angle for paving equipment. The bi-fold ramps each have 3 coil springs to assist easy one man operation. Kaufman Trailers 30' tri-axle paver flatbed trailer features a 14" I-beam high tensile mainframe with cold-formed tongue, oil-bath triple dual axles with electric brakes, and standard 9' bi-fold paver ramps. This trailer is usually purchased with the optional 8' hydraulic ramps which make it ideal for hauling larger paving equipment.